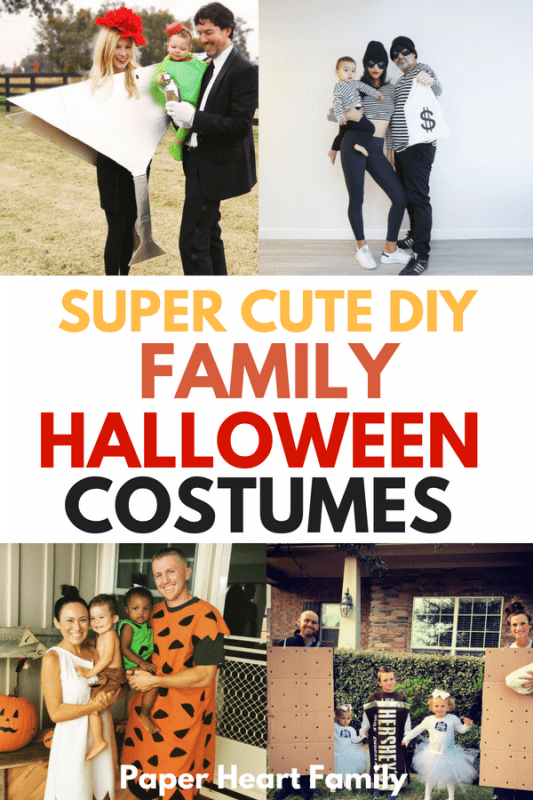 If you’re looking for some amazing, creative family Halloween costume ideas, do I have a great list for you! Halloween is fun for kids of course, but with these family costume ideas, everybody can get in on the fun! This post has some really creative ideas. Some of them you can easily DIY, and others you’re going to have to buy, but whatever your plan, these photos are guaranteed to inspire. When I was trying to find family Halloween costumes, I turned to Instagram to see what the mamas over there came up with. And they did not disappoint. And just a side note, OMG, why are there so many beautiful people on Instagram?! What I love so much about this family costume is how simple it is, and how sweet. As long as your child has a Mickey costume, you’ve just got to make yourself look like a tourist and you’re golden! If you were thinking about dressing your baby up in a bunny Halloween costume, why not complete the look with the addition of a magician and magician’s assistant? Simple DIY costumes that are totally cute. Can you believe that this mama was pregnant and DIYed these adorable skeleton costumes by hand cutting each bone out of felt and ironing them on?! If she can do it, then why not you? If my husband saw this, I know he would jump right on the family halloween costume band wagon. And again, this is super simple because I bet you already OWN most of this stuff. I really can’t get enough of the cops and robbers costume ideas. Seriously. And throw in a super cute kid, and you’ve got a recipe for the best costumes in town. And the Little Tykes Cozy Coupe Police Car? Gah, I just. can’t take. the CUTENESS. Family motto: The s’more the merrier! Happy Halloween from the Sauvageaus! The cuteness continues! This family of five dressed up and only actually purchased one costume. You need a Hershey’s costume, a couple tutus for marshmallows (which are totally multi-purpose) and some cardboard for some very authentic looking graham crackers. Anyone now craving a s’more? What better costume for a family than one of the most popular TV cartoon families! Get yourself some big sheets of felt and you could whip up these costumes in no time. I don’t know whether to call this one CREEPY or creative. It’s definitely a little bit of both, and I’m sure that having twins isn’t a necessity in order to pull this one off. 🎼You’re the ones that I want. . . oooh oooh oooh honey! 🎤❤️ Hope everyone has a fun and safe Halloween today!! How is it that with just a few carefully selected accessories a costume can be so obvious? I adore this one, and if you have a daughter, you could totally have her ditch the “trick or treat” for a “tell me bout it, stud” instead. Gosh, isn’t this ADORABLE? If you go for this idea, your pre-trick or treat preparations better include some Chim Chim Cher-ee. Just some more robber costume inspiration. You can never have enough! They’re creepy and they’re cooky… or in this case, absolutely gorgeous. I don’t think the Addam’s Family ever looked this good, but I LOVE it. Can you believe how freaking cute this family is? How about dressing your family up as some loggers? And I definitely recommend including a fun photo shoot into your Halloween festivities. Another example of why a Halloween costume photo shoot is a must! This family’s circus costumes and entire set-up take creativity up a notch. I mean seriously, they thought of everything! You’ve got the lion tamer, the popcorn passer-outer, the lion, the Ringmaster, the strongest man in the world… LOVE. I feel like I’m saying the same things over and over, but oh my goodness, I’m on cuteness overload. (And if you want to check out more of this beautiful family, just click the pic). The chef costumes would be real easy to throw together, too, making this a good last minute option. This is a total DIY family costume. Who would have thought to put a baby in an olive costume, and then dress yourself in a cardboard martini glass?! This might just be the most creative costumes on this list. Going trick or treating as Popeye and Olive Oyl (and don’t forget the cutest spinach ever) will not only give you the chance to score some candy, but it will also give your husband the chance to show off his biceps. Even though I am sure there are probably no other mamas on the face of the planet who look as amazing as Yvette, I still think that this is a pretty great family costume idea. And if you’re not feeling like a real-life Princess Jasmin, you could always go as Rajah and have one of your kids be Jasmine. 90’s mamas, where you at? How cute is this Super Mario family? I love the idea, I love the bright colors, and if you live in a cold climate, these costumes will keep you warm for sure! Do our kids even know about Ghostbusters? Well, they should! Bring back the ridiculous awesomeness that is the Ghostbusters with these costumes. Don’t you adore the addition of the ghost balloons? If you’re not yet over Elsa If your kids are not yet over Elsa, this is definitely a family costume idea that would please the little princesses in your family. This family’s costumes are seriously so simple, but there is something so great about it. Perfect for the younger crowd in love with fairy tales. What I want to know is are those pajamas? If so, I think I need them. The perfect family costumes for animal lovers! Okay, so when I said earlier that you could always go as Rajah and have your daughter go as Jasmin, this isn’t what I had in mind (Veronique is one hot mama!). However, if you’ve got it, flaunt it! And last but not least, one more Super Mario costume idea for you. I love that this mama used an old prom dress. Super smart! Now excuse me while I go see if I still have my old prom dresses. I hope you found some inspiration! What costumes are you thinking about going with for your family? Breastfeeding Tips For Pain- Get Relief Fast!